Jun-Yan Zhu*, Taesung Park*, Phillip Isola, and Alexei A. Efros. "Unpaired Image-to-Image Translation using Cycle-Consistent Adversarial Networks", in IEEE International Conference on Computer Vision (ICCV), 2017. If you have questions about our PyTorch code, please check out model training/test tips and frequently asked questions. CycleGAN course assignment code and handout designed by Prof. Roger Grosse for "Intro to Neural Networks and Machine Learning" at University of Toronto. Please contact the instructor if you would like to adopt this assignment in your course. Karoly Zsolnai-Feher made the above as part of his very cool "Two minute papers" series. Nice explanation by Hardik Bansal and Archit Rathore, with Tensorflow code documentation. Researchers, developers and artists have tried our code on various image manipulation and artistic creatiion tasks. Here we highlight a few of the many compelling examples. Search CycleGAN in Twitter for more applications. What if Claude Monet had lived to see the rise of Americana pastoral kitsch in the style of Thomas Kinkade? And what if he resorted to it to support himself in his old age? Using CycleGAN, our great David Fouhey finally realized the dream of Claude Monet revisiting his cherished work in light of Thomas Kinkade, the self-stylized painter of light. 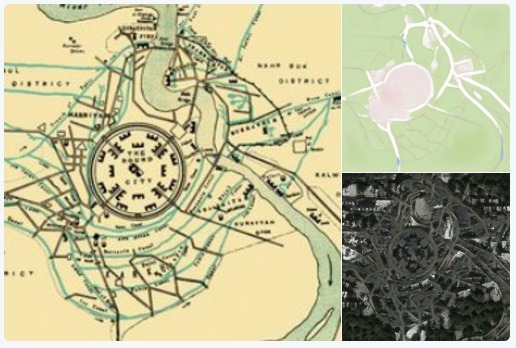 Jack Clark used our code to convert ancient maps of Babylon, Jerusalem and London into modern Google Maps and satellite views. Mario Klingemann used our code to translate portraits into dollface. 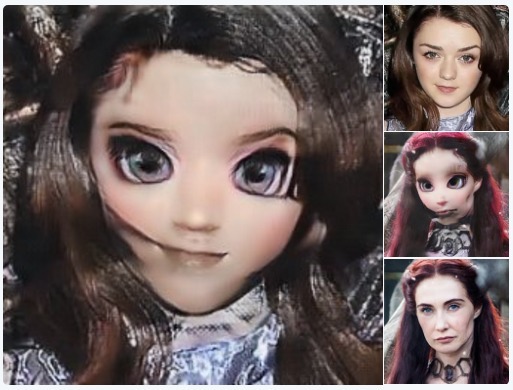 See how the characters in Game of Thrones look like in the doll world. 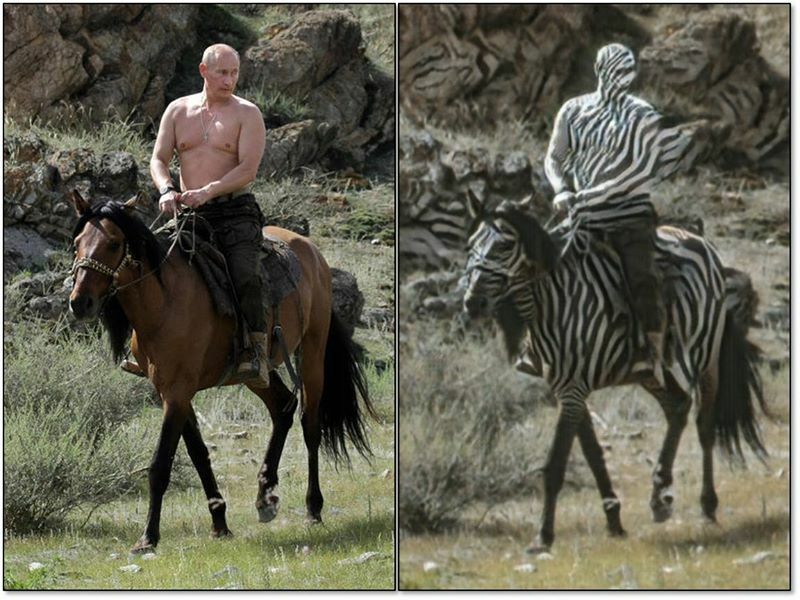 Mario Klingemann trained our method to turn legacy black and white photos into color versions. itok_msi produced cats ↔ dogs CycleGAN results with a local+global discriminator and a smaller cycle loss. 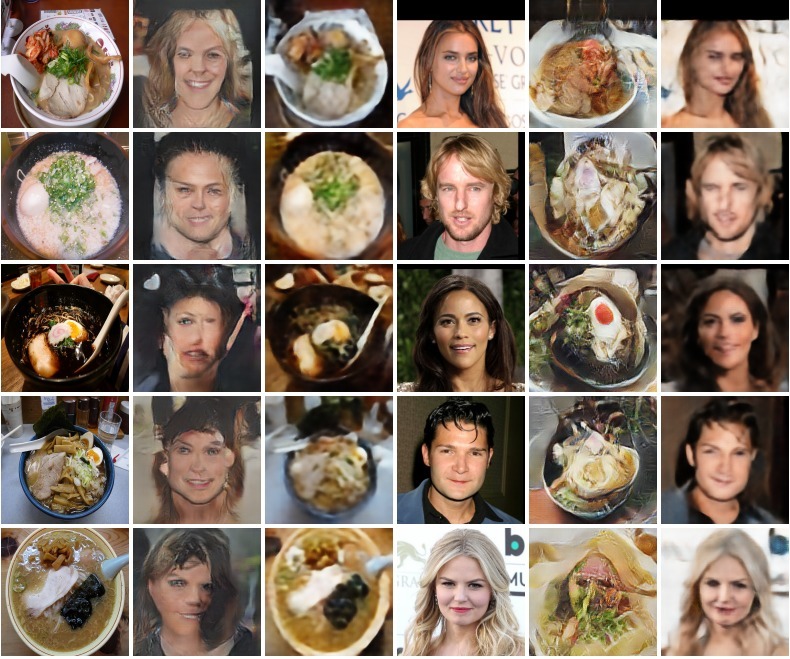 Eran Hadas and Eyal Gruss used CycleGAN to convert human faces into vegetable portraits. They built a real-time art demo which allows users to interact with the model with their own faces. Chintan Trivedi used CycleGAN to translate between Fornite and PURB, two popular Battle Royale games with hundreds of millions of users. Now you can enjoy the gameplay of one game in the visuals of the other. Check out his blog for more cool demos. 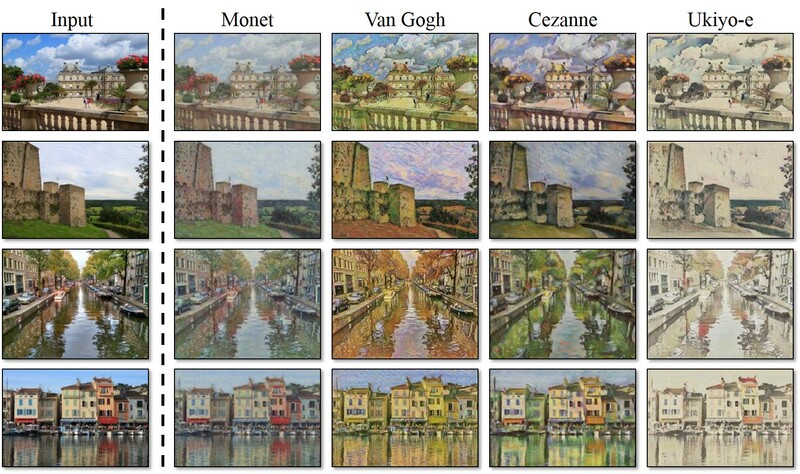 Transferring input images into artistic styles of Monet, Van Gogh, Ukiyo-e, and Cezanne. Translation between driving scenes in different style. Each frame was rendered independently. The GTA → Cityscapes results of CycleGAN can be used for domain adaptation for segmentation. 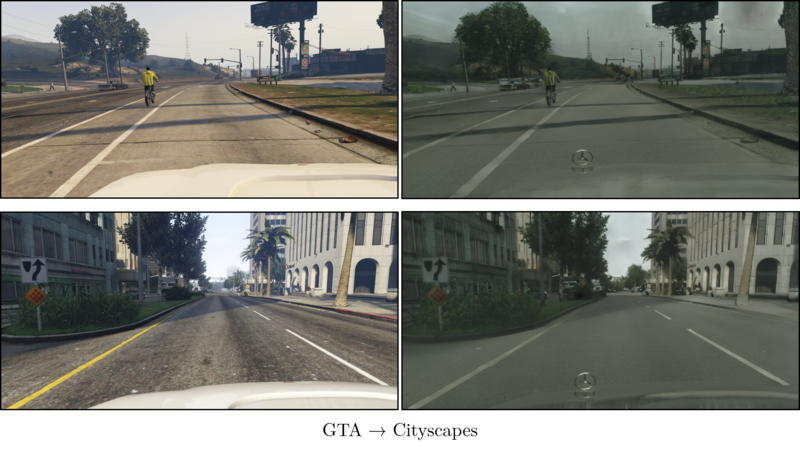 A segmentation model trained on the Cityscapes-style GTA images yields mIoU of 37.0 on the segmentation task on Cityscapes. More information can be found at Cycada. You can download the original GTA images (18GB) and the translated Cityscapes-style GTA images (16GB). iPhone photos → DSLR photos: generating photos with shallower depth of field. Comparison on Cityscapes: different methods for mapping labels ↔ photos trained on Cityscapes. Comparison on Maps: different methods for mapping aerialphotos ↔ maps on Google Maps. Facade results: CycleGAN for mapping labels ↔ facades on CMP Facades datasets. Ablation studies: different variants of our method for mapping labels ↔ photos trained on Cityscapes. 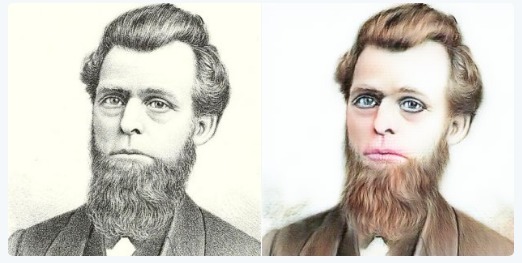 Image reconstruction results: the reconstructed images F(G(x)) and G(F(y)) from various experiments. 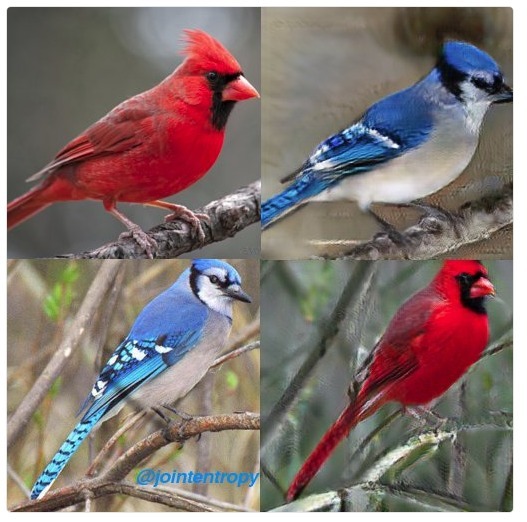 Style transfer comparison: we compare our method with neural style transfer [Gatys et al. '15]. 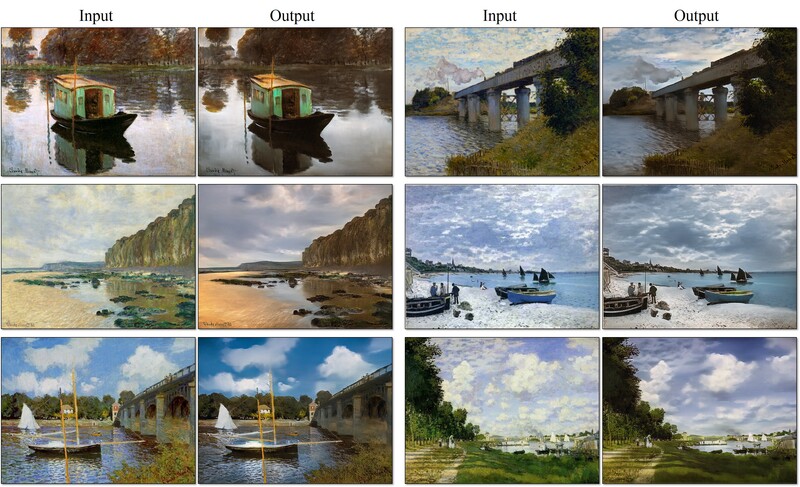 Identity mapping loss: the effect of the identity mapping loss on Monet to Photo. 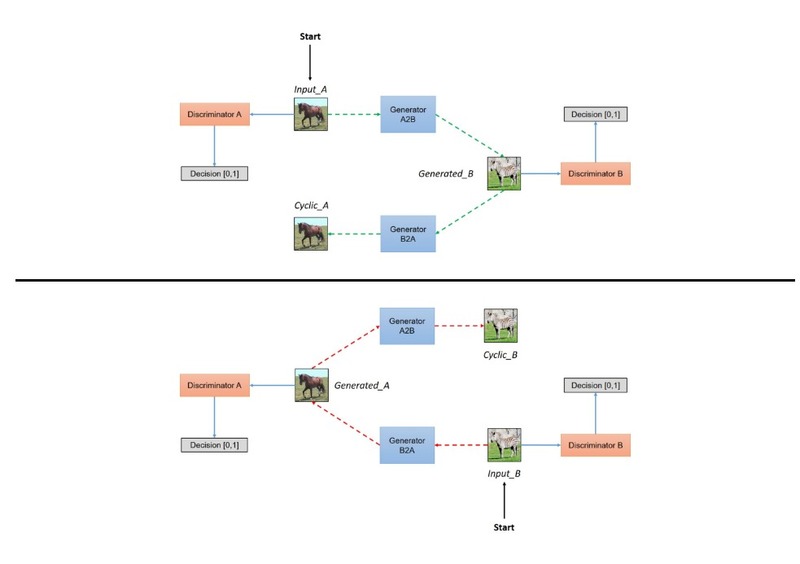 Our model does not work well when a test image looks unusual compared to training images, as shown in the left figure. See more typical failure cases [here]. On translation tasks that involve color and texture changes, like many of those reported above, the method often succeeds. We have also explored tasks that require geometric changes, with little success. For example, on the task of dog ↔ cat transfiguration, the learned translation degenerates into making minimal changes to the input. Handling more varied and extreme transformations, especially geometric changes, is an important problem for future work. We also observe a lingering gap between the results achievable with paired training data and those achieved by our unpaired method. In some cases, this gap may be very hard -- or even impossible, -- to close: for example, our method sometimes permutes the labels for tree and building in the output of the cityscapes photos → labels task. To resolve this ambiguity may require some form of weak semantic supervision. Integrating weak or semi-supervised data may lead to substantially more powerful translators, still at a fraction of the annotation cost of the fully-supervised systems. Jun-Yan Zhu, Philipp Krähenbühl, Eli Shechtman, and Alexei A. Efros. 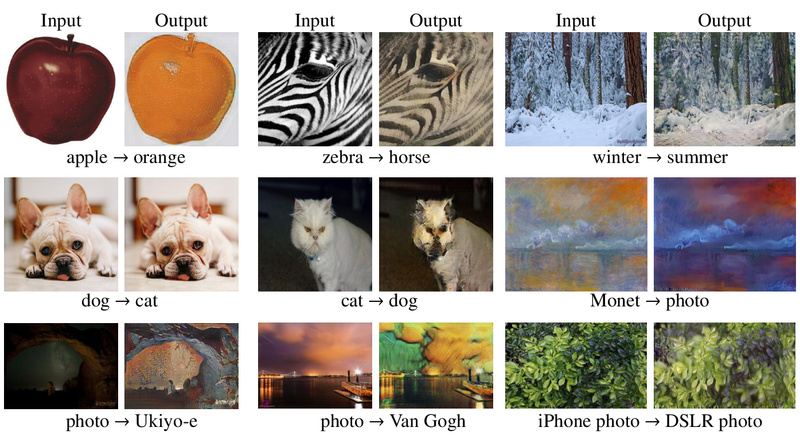 "Generative Visual Manipulation on the Natural Image Manifold", in ECCV 2016. Phillip Isola, Jun-Yan Zhu, Tinghui Zhou, and Alexei A. Efros. 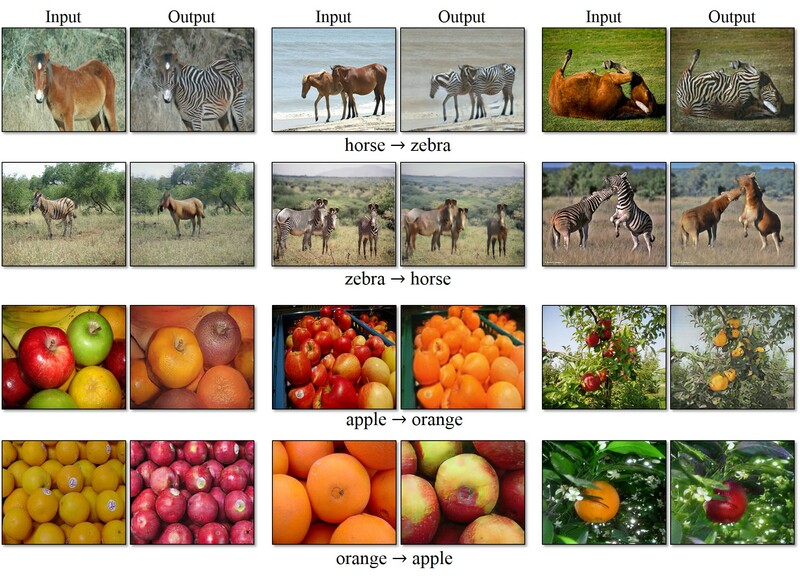 "Image-to-Image Translation with Conditional Adversarial Networks", in CVPR 2017. We thank Aaron Hertzmann, Shiry Ginosar, Deepak Pathak, Bryan Russell, Eli Shechtman, Richard Zhang, and Tinghui Zhou for many helpful comments. This work was supported in part by NSF SMA-1514512, NSF IIS-1633310, a Google Research Award, Intel Corp, and hardware donations from NVIDIA. JYZ is supported by the Facebook Graduate Fellowship, and TP is supported by the Samsung Scholarship. The photographs used in style transfer were taken by AE, mostly in France.